What is Fiorga Art Filler Fine Lines? Fiorga Art Filler Fine Lines is a cosmetic filler made with a combination of cross-linked and free hyaluronic acid for a smooth texture, as well as lidocaine for improved treatment comfort. Doctors use this dermal filler to smooth the look of fine lines while helping to improve skin hydration and elasticity. While other hyaluronic acid injectables add intense volume to correct wrinkles, this filler provides just enough volume to smooth superficial wrinkles without overcorrecting. 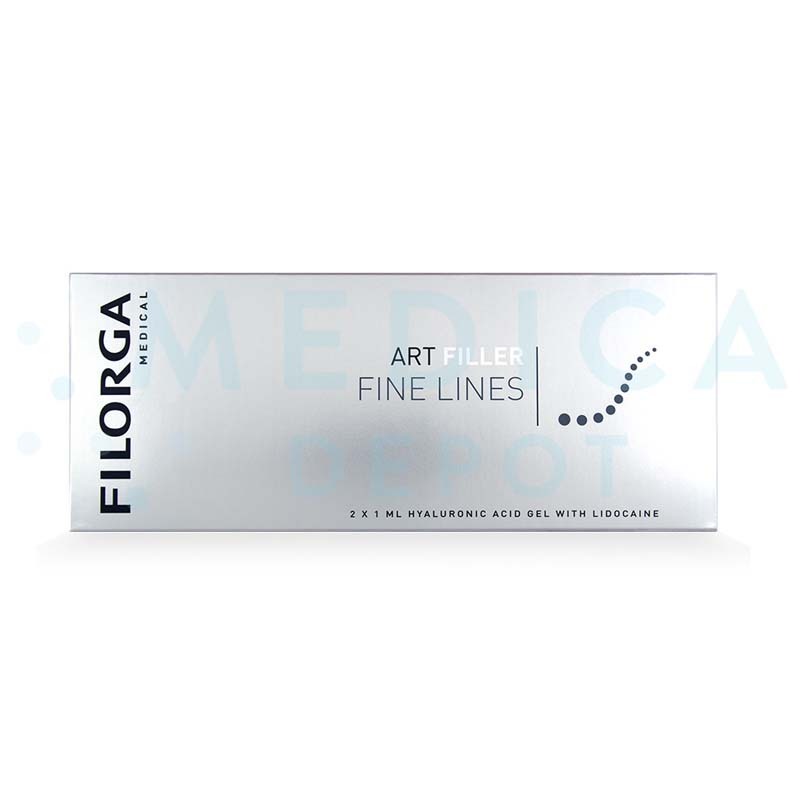 Medical professionals may buy Filorga Art Filler Fine Lines from Medica Depot. Enjoy the convenience of purchasing this and other dermatology products online while benefitting from low, wholesale prices. Purchase this and other genuine brand-name aesthetic products online, by phone, or by fax. 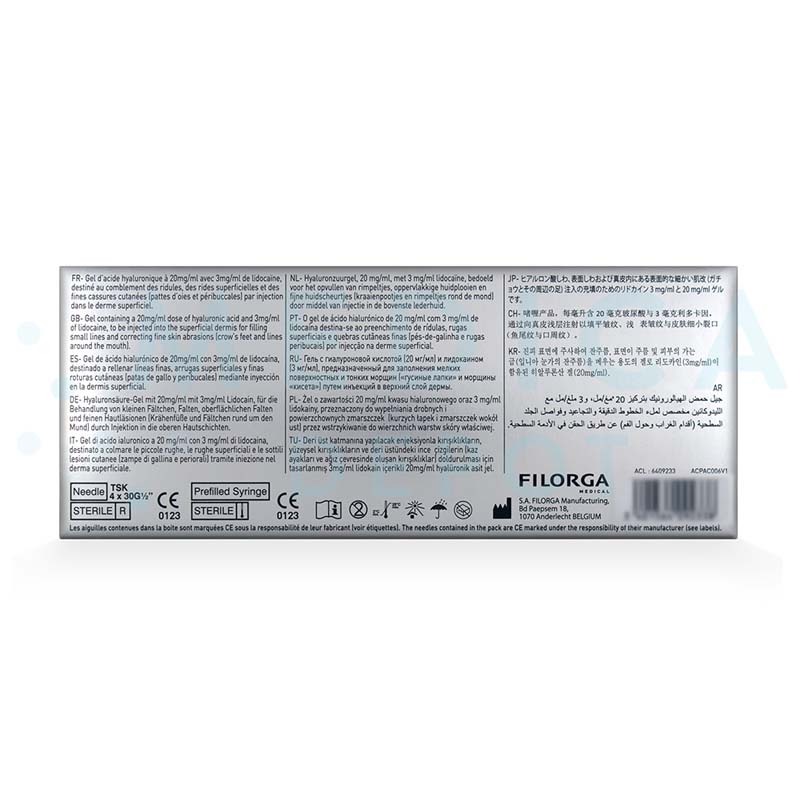 Genuine, brand-name injectable from Filorga, a popular French skincare company. Contains lidocaine for more comfortable treatments. Mixture of cross-linked and free hyaluronic acid makes this gel long-lasting yet smooth. Lasts about 9–12 months, or up to 18 months with a touch-up treatment. How does Filorga Art Filler Fine Lines work? This injectable gel is made of a mixture of cross-linked and free hyaluronic acid. This combination allows the hyaluronic acid to be long lasting, while also giving it a smooth texture for subtle results. After you inject the hyaluronic acid into your patient's skin, it holds up to 1,000 times its weight in moisture, restoring skin hydration and subtle volume. The added volume helps support skin to smooth the look of fine lines. In addition to its hydrating and volume-adding properties, hyaluronic acid can help stimulate collagen growth, which can strengthen and rejuvenate skin. The inclusion of lidocaine anesthetic in this dermal filler helps reduce needle pain during treatment for greater patient comfort. What are the ingredients in Filorga Art Filler Fine Lines? This cosmetic filler contains a mixture of free and cross-linked hyaluronic acid as well as lidocaine. 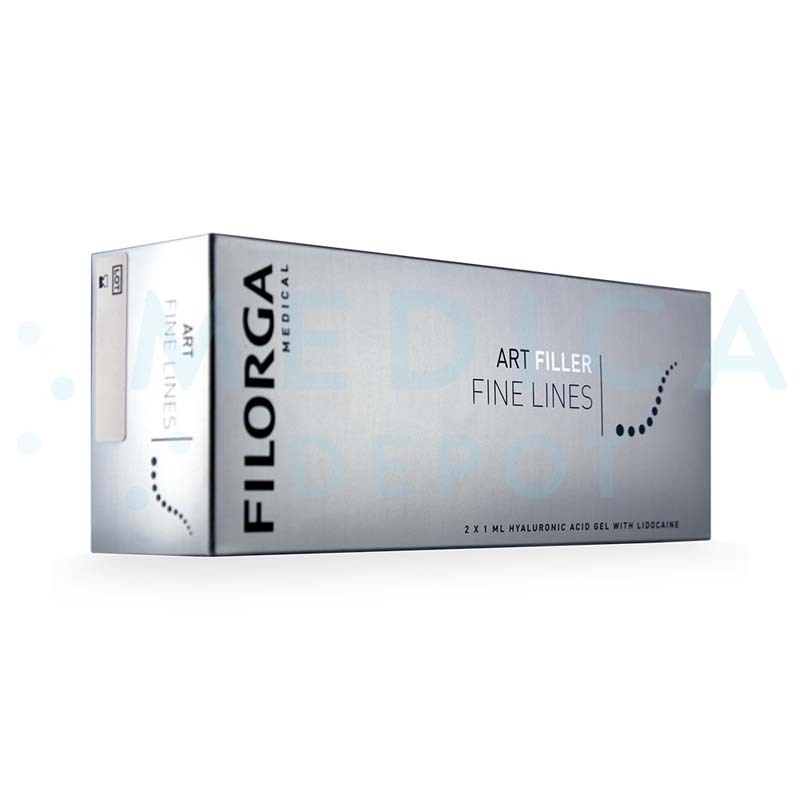 What is the difference between Filorga Art Filler Fine Lines and other Filorga products? Compared to Universal, Lips, and Volume, Fine Lines has the smoothest formula and lowest filling ability, making it most suitable for fine lines. Filorga's HA line of products differs from their Art Fillers in that it rejuvenates skin without adding significant volume. Meanwhile, while the Art Fillers are meant for restoring volume to skin. Inject this hyaluronic acid gel into the upper dermis using a 30G needle, following proper aseptic techniques. Gently massage the treated area after the injection to ensure even distribution. For full instructions on use, please consult the included product leaflet. This dermal filler is used to smooth the look of fine lines and wrinkles through the subtle addition of volume. Administer an initial treatment, then perform a touch-up treatment after 9 months to extend its results. Results last about 9–12. months but administering a touch-up treatment can extend the results to 18 months. You can use this cosmetic injectable on crow's feet or other superficial wrinkles. Who is an ideal candidate for Filorga Art Filler Fine Lines treatments? The ideal candidate for this treatment is a patient who is noticing early signs of aging, such as crow's feet or other fine lines. These injections can help smooth skin while boosting collagen and elastin synthesis for facial rejuvenation. Why should I purchase Filorga Art Filler Fine Lines? Purchase this dermal filler to help your patients improve and maintain the youthful look of their skin. Filorga is made by a trusted French skincare company, so you and your patients know you can count on this injectable to provide quality results. The presence of lidocaine helps make treatments more comfortable for your patients, while saving you from having to use a separate anesthetic. 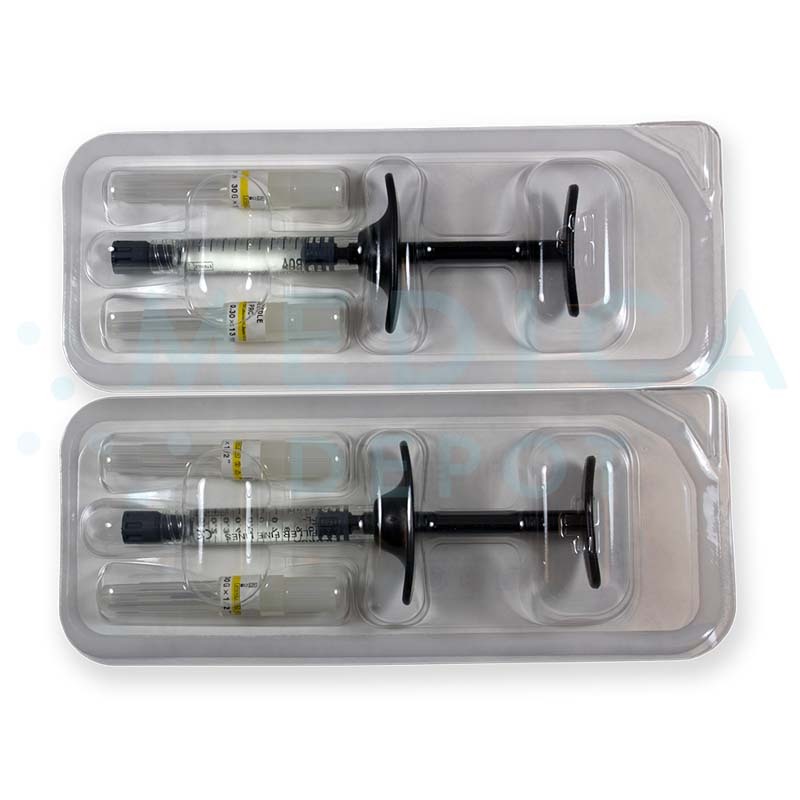 Moreover, the ergonomically designed syringe and easy injectability of the gel make treatments more comfortable for you as you administer them. 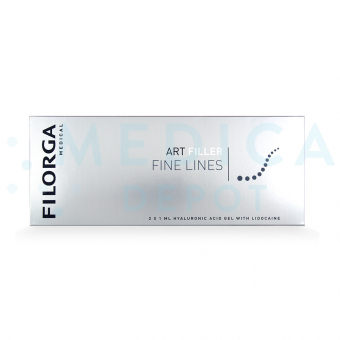 Most of all, by purchasing Filorga Art Filler Fine Lines from Medica Depot, you save money with low wholesale prices. What are Filorga Art Filler Fine Lines' side effects? Side effects may include redness, swelling, itching, bruising, and discoloration at the injection site, superficial erosions in the crow’s feet area, soreness when pressed, and the formation of nodules. Rarely, necrosis of the glabella, abscesses, granulomas, or hypersensitivity may occur. Minor side effects should resolve themselves within 1 week. Any adverse effects should be reported immediately to a medical professional.